If you haven’t read Christy, you should. It is simply wonderful. 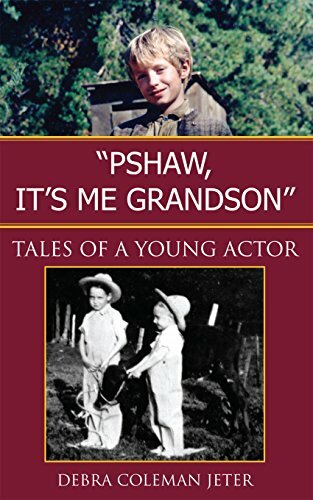 If you love it, or if you are interested in true tales about child actors, or about growing up during the Great Depression, I suspect you’ll love “Pshaw, It’s Me Grandson”: Tales of a Young Actor. The road to maturity is filled with chug holes and chuckles for rambunctious child actor Clay Jeter and his grandfather Clifton Coleman. Story of Two Special Guys: Clay is cast as a regular in the series Christy, filmed in the hills of eastern Tennessee, at the age of nine. Much of the usual struggle for recognition and approval associated with the Hollywood industry finds its way to this isolated mountain community. Because both Clay’s parents are working full time, his grandfather Clifton serves as Clay’s guardian. The television series being filmed is set in a poor farm community, much like the one where Clifton grew up. The show brings back memories for Clifton and, while Clay is working, he watches and remembers. The book dramatizes the similarities between Clifton’s country childhood and the fictitious childhood that Clay acts out on the set. Being on the set of the show provides a subtle but dramatic spiritual transformation for both principal characters, as Clay comes of age and Clifton comes to terms with his past and its effect on his life. From Clay’s perspective, the choices and changes in his life loom enormous. First he has to choose between his weekly soccer match and an audition for a role he may not get. But land the role he does, and soon soccer games are becoming a part of Clay’s past. Because both of his parents are working full time, his grandfather Clifton serves as his guardian. On the set, Clay is torn between a drive to maximize his joy in each moment, which leads him into mischief, and the occasional urge to land a big part. Eventually, Clay is given some of the choicest roles in the final episodes. This leads to even more confusion, however, as the series ends and Clay returns to normal school life. Clay learns lessons not only from life but also from the storyline of the episodes. The television series being filmed is set in a poor farm community, much like the one where Clifton grew up. Clifton reflects constantly on his own history as he watches his grandson re-enact a life that is eerily similar to his own youth. The flashbacks to Clifton’s childhood include Clifton’s participation in church plays as a small boy and the day his own father was baptized. Clifton gets into trouble a lot, like Clay, and learns a few lessons himself about behaving and misbehaving. As the mature Clifton watches and remembers, he is forced to face the reality of his relationship with his father Ray and his ongoing struggle to redeem himself in his father’s eyes, even after Ray’s death. Comparing himself to Ray, to his favorite Uncle Punch, and to his grandfather Pa Byerly (who is quoted in the title of the book), Clifton realizes that he has spent much of his life trying to be someone he is not. Although he sets out to teach Clay lessons about life from the wisdom of his years and experience, he ultimately discovers that it is Clay who has taught him the greater lesson.